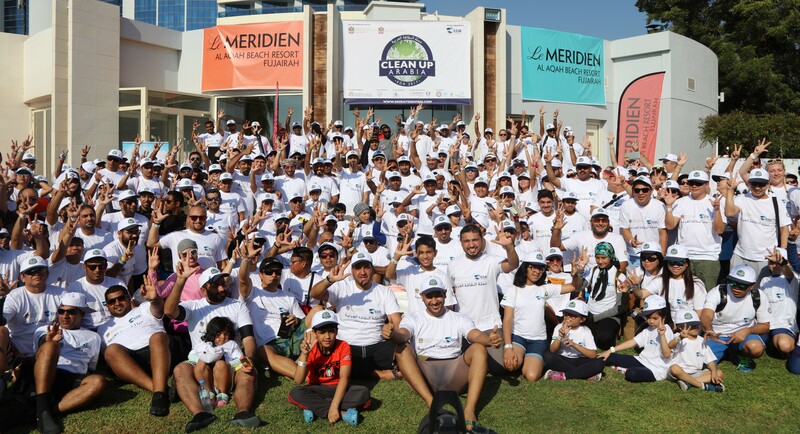 Dubai-UAE: November, 2017 – The Emirates Diving Association (EDA) has launched the ‘Clean Up Arabia 2017’ campaign on Saturday, November 4, for the 22nd consecutive year at Dibba city in Fujairah. The drive witnessed wide participation of volunteers from different public and private organisations and will cover the beaches and diving sites in the UAE and participating countries in the region. The campaign is organized by EDA in collaboration with the Ministry of Climate Change and Environment (MOCCAE), Dibba Municipality and the Critical Infrastructure and Coastal Protection Authority. It is also backed by the Australian ‘Clean Up the World’ campaign, the USA-based ‘International Coastal Clean-up’ and the Project AWARE Foundation. Clean Up Arabia is an annual voluntary campaign that aims to clean up the diving sites and beaches of the UAE and surrounding regions. The campaign also aims at engaging the community members from all walks of life to make a difference, saving the marine environment from pollution, making awareness among people to have a positive attitude in maintaining a clean and sound environment by practice and participation. Launching the campaign, His Excellency Dr. Thani bin Ahmed Al Zeyoudi, Minister of Climate Change and Environment, said that MOCCAE, and in line with its strategic objectives to ensure a sustainable environment, is keen on cooperating and coordinating with strategic partners from both the government and the private sectors in launching campaigns and national initiatives that will enhance the protection and conservation of the marine environment. His Excellency pointed out that these campaigns come within the framework of the ministry’s efforts to promote a culture of social and environmental responsibility among members of the society, and contribute effectively in establishing a sense in individuals that protecting the natural environment and keeping it clean is everyone’s responsibility and must be a daily behavior, and that it is not limited to the concerned authorities only. Dr. Al Zeyoudi stressed that everyone has the potential to make a real difference in preserving his surrounding environment. “The campaign is a qualitative effort that contributes to increasing public awareness on the various environmental issues. It gives practical solutions to overcome the problems that threaten the safety of the local and regional environment. The campaign is one of our major activities during 2017, the Year of Giving”, Al Ghurair added. Number of registered volunteers participating in the campaign this year reached more than 3000 from different public and private organisations in the UAE. The launch of the campaign started from Dibba city in the Emirate of Fujairah with the participation of hundreds of environmentalists and conservationists who will be provided with all necessary tools for cleaning operations and waste removal. EDA will record the quantities of different types of collected waste to monitor the amount of pollution resulting from such wastes. The recycled waste will be sent to the specialized sites to be reused. This annual, regional event was kick-started into action back in 1995 with the support and backing of all EDA volunteers and loyal sponsors and partners.